I am emerging from the writing cave! It is bright out here. Here's what's been going on since we last talked. 1. Um... I've been writing. And I have to say the sequel to EVERNEATH is coming along. Which is good because it's due tomorrow. 2. EVERNEATH comes out in four months. FOUR MONTHS! And three days. THREE DAYS! And if you're like me, and you have trouble counting backward from the higher numbers like 8, I have the perfect thing for you. Presenting... the EVERNEATH countdown widget! I shall call him Widgy, and we shall play and play. Would you like Widgy for your own blog sidebar? Then you are in luck. All you have to do is press on the doohickee at the bottom of Widgy and then there will be some sort of html code-a-ma-thingee that you can add to your blog. Sorry for all the technical terms. Many thanks to Katie Wood Ruffin who was kind enough to make Widgy. 3. 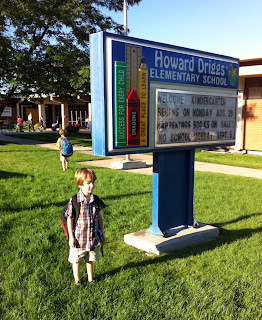 I sent my youngest, kid B off to Kindergarten. Could he possibly look any smaller? I always make fun of those moms who shed a tear when their kids make it to kindergarten. Monday was no exception. I had the best insults at the ready. But my censure of those moms was muffled by the snot draining from my nose and the waterworks running from my eyes. All my excellent jabs toward them were interrupted by sniffles, and the delivery was stifled, and eventually those other wimpy moms just walked away, and I ran after them, blowing my nose on my shirt and slipping on my own tears, because they had to know that this was supposed to be a day of celebration, and they were being ridiculous. The final blow was when Kid B, who has a difficult time talking, looked at me as I was leaving, and said, "I go home now?" And I said, "No. You get to stay and have fun." And he looked all around the classroom - so unsure of everything going on - and then back at me and said, "No, I go home now." So I ripped open my chest and handed him my beating heart, and told him to hold on to it until we were together again. So, dear friends, what's going on with you? Thank you so much for being nice to the guest bloggers, Sam and my mom. They felt so at home, they begged to blog some more. On my second son's (MY Kid C) first day of kindergarten, he ran out of his classroom as my hubby was leaving the grounds to get one last hug. Then, five minutes after hubby got home, in ran Kid C for more hugs. And to tell daddy he loved him. Followed by a random mom who had taken over the chase from his teacher (the assistant principal). She was able to assure us that 1) Kid C is FAST, 2) Kid C refuses to talk to strangers, even when they are running after him and calling his name, 3) that he looks both ways before he crosses the street. Robin- That is the best kindergarten story ever. So. Funny. *sob* Brodi. Stop that! (And my baby's 21 and in college). What are those gorgeous flowers your little guy is sitting by? If you look at that picture with Kid B next to the sign, you can see Kid C walking off to go the front of the school - he was completely done taking pics. Donna - those are Mandevillas...they have these beautiful pink flowers that blossom all summer. 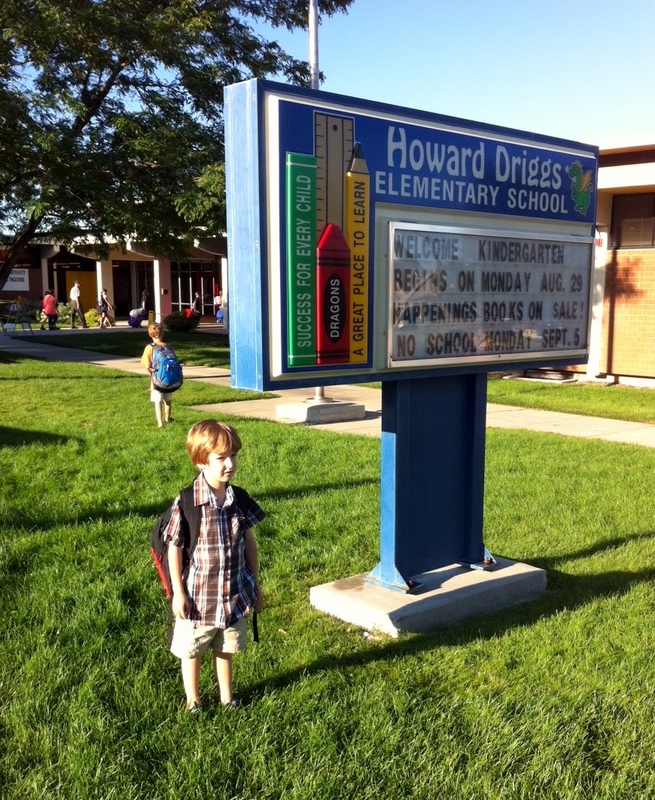 Awww...first day of kindergarten. My chipmunk grinned and went into class like a big girl while I stood there quivering and smiling while poorly hiding the tears. Digressing from my tear show from two years ago, Yay for the widgy. Now if you ever get lost counting down, which would happen if it were me, you have help to keep you honest. Angela- Mr. Widgy is a very dependable and loyal friend. And he loves math! Oh poor kid B! I'm glad he...and you...survived. I'm adding the widget to my blog for sure. I'm excited!!! I'm glad that Kid B was found after said lost incident. :) And, ay for Mr. Widgy! :) I'm not normally a countdown kind of person, but I may make an exception because I LOVED your book. Great post! And no, I don't think he could look any smaller. Also, good luck with your draft! I'm sure it'll be epic. WHAT??!! you've made fun of my tears all these years and i never knew it?? LOL...it's ok though-i make fun of MY OWN tears too! at least now you "get it"--it only gets harder. wait til kid B is a senior. i cried not only the FIRST day of school, but also every other day since. :( (self admitted looser here)! Katie- It's totally worse for us than it is for them. Jenni- Aw thanks. And Mrs. Widgy thanks you too. Elana- I'm hoping that to make it epic, I can just use the word "epic" a lot in the draft. I'll let you know if it works. Dorien- I fully believe I will cry over my teenagers much more than I'm crying over my little ones. Love Widgy. And your first day of school story? Ripped my heart out right with yours. Those words, "I go home with you now?" Geesh. Kill me. I think it's phenomenal Kid B is at Driggs. He has come so far. And this is a huge thing for you - to leave him there, trust in the system. You're a great Mom Brod. Love ya. Welcome back! 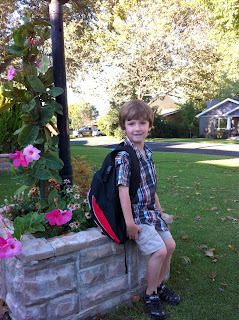 Congrats on sequel progress and on surviving your last first day of kindergarten. And thanks for including all of us in the snot dripping and tear shedding. You have a way with words! How exciting to count down the days until your book comes out! And sending your boy off to Kindergarten. Oh man. My baby boy is 12 and just started junior high but I still remember him getting on the bus his first day in kindergarten and looking back at me with those big blue eyes as the bus pulled away. sniff. sniff. and I'm not one of those wimpy moms either. We have it all on video. Cath- I am so happy Kid B is at Driggs too. We've already come so far, even though we have a long ways to go. Nikki- Snot is so easy to describe. Thanks! Alice- I'm so glad there wasn't a video camera around! I would have to confiscate it. Welcome back. I hope that your had some sunglasses on when you came out of your writing cave. Kid B, Kindergarten, where has the time gone. WOW!